NAPA Bulletin series is dedicated to the practical problem–solving and policy applications of anthropological knowledge and methods. These papers demonstrate the diverse ways in which anthropology can be used to address the global food crisis while directly responding to local realities. 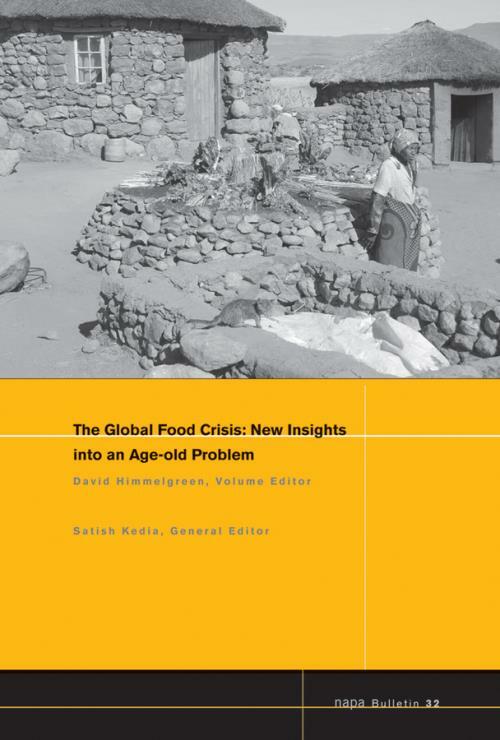 Anthropological Approaches to the Global Food Crisis: Understanding and Addressing the "Silent Tsunami" (David Himmelgreen and Nancy Romero–Daza). Rising Food Prices, Social Mobilizations, and Violence: Conceptual Issues in Understanding and Responding to the Connections Linking Hunger and Conflict (Ellen Messer). Dealing with the Global Food Crisis in Local Settings: Nonintensive Agricultural in Lesotho, Southern Africa (Nancy Romero–Daza, David A. Himmelgreen, Charlotte A. Noble, and David Turkon). Asking the Right Questions: Community–Based Strategies to Combat Hunger (Miriam S. Chaiken, J. Richard Dixon, Colette Powers, and Erica Wetzler). Economic Restructuring and Urban Food Access in the Dominican Republic (Howard Rosing). The Forgotten Population? Youth, Food Insecurity, and Rising Prices: Implications for the Global Food Crisis (Craig Hadley, Tefera Belachew, David Lindstrom, and Fasil Tessema). Food Insecurity in Buhaya: The Cycle of Women′s Marginalization and the Spread of Poverty, Hunger, and Disease (Valerie Githinji). Lavichè: Haiti′s Vulnerability to the Global Food Crisis (John Mazzeo). Mosaics of Maya Livelihoods: Readjusting to Global and Local Food Crises (Rebecca K. Zarger). From Crisis to Cumulative Effects: Food Security Challenges in Alaska (David V. Fazzino and Philip A. Loring). Things Became Scarce: Food Availability and Accessibility in Santiago de Cuba Then and Now (Hanna Garth). Anthropological Approaches for Understanding the Complexities of the Global Food Crisis (Sunil K. Khanna).